This walk starts with a bit of "list management" as I like to call it. 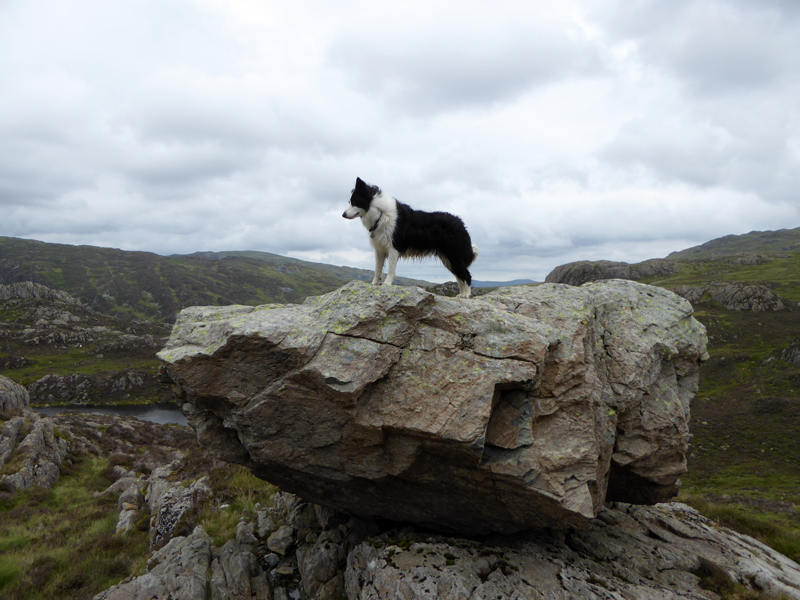 Just a few of the Lakeland Felltops have not felt the weight of my boots in this decade and Robinson is one them. 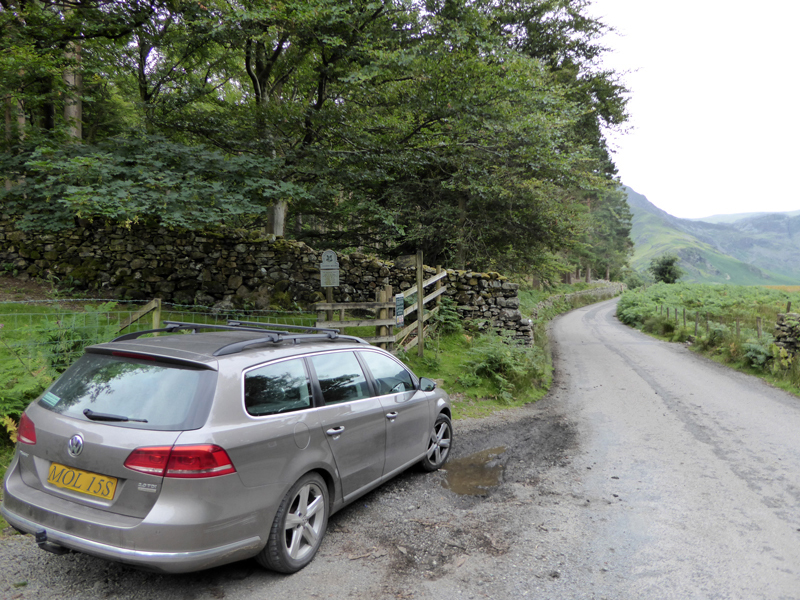 Parking at Hassness is reserved for just the first two or three arrivals, otherwise the nearest facility is at Gatesgarth, currently £4 per day. 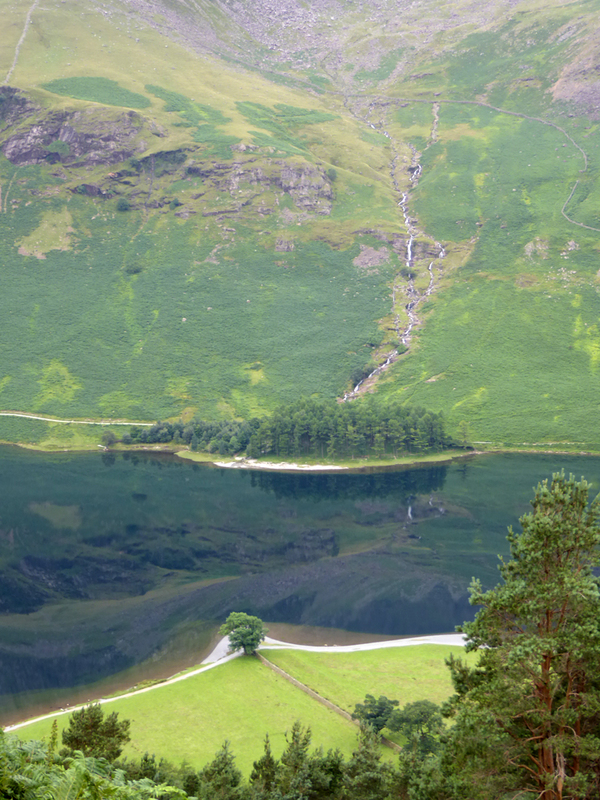 One potential benefit of walks starting in Buttermere is that you can wander off in many directions and maybe use the bus service to get back to the car. Take a few quid with you if don't carry a bus pass. 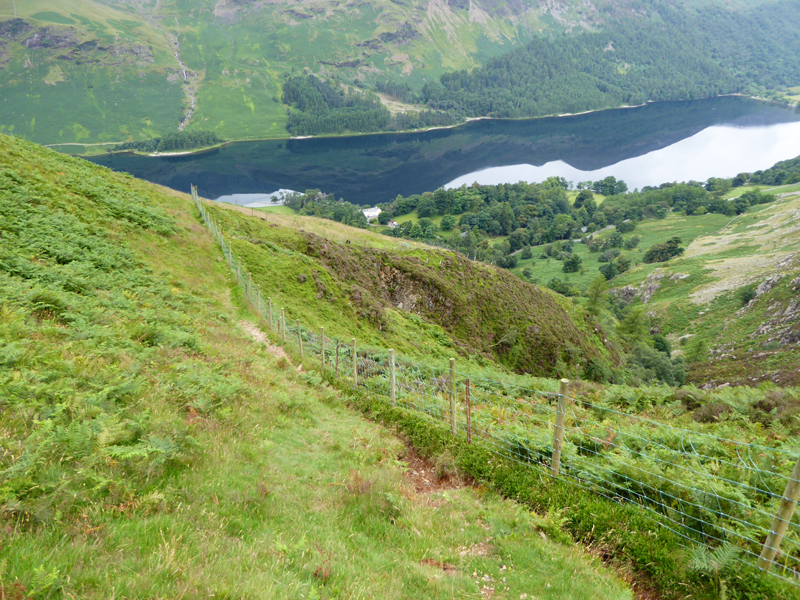 I'm not sure where we are going after Dale Head. 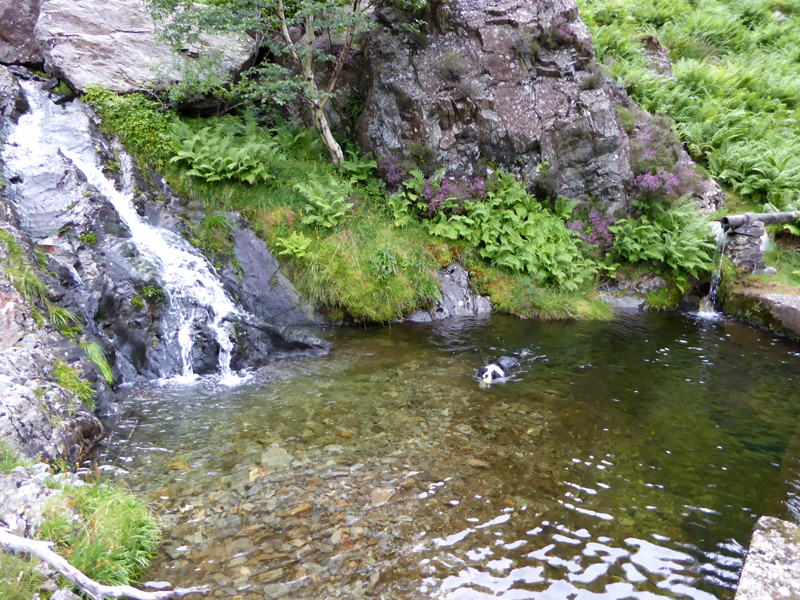 A small reservoir in Hassenhow Beck provides Molly with an early swimming opportunity. 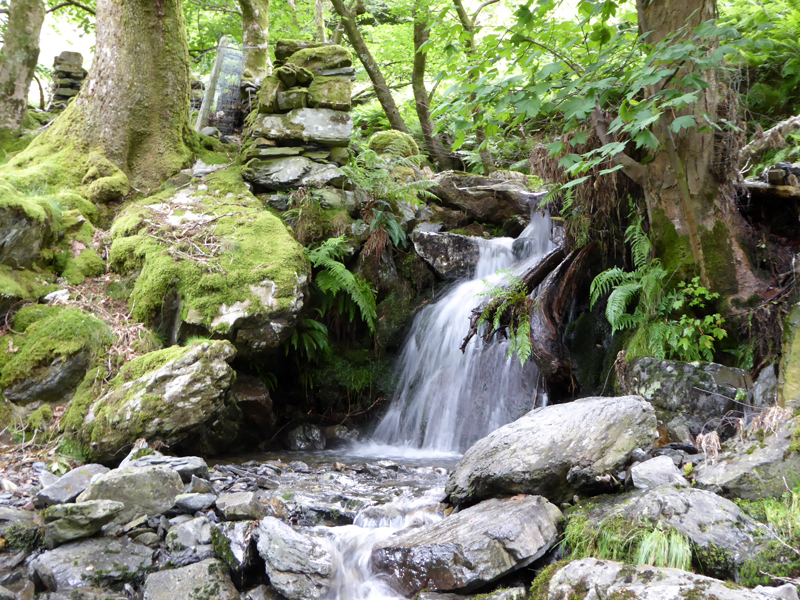 Probably a water supply for the properties at Hassness, hopefully filtered before use. 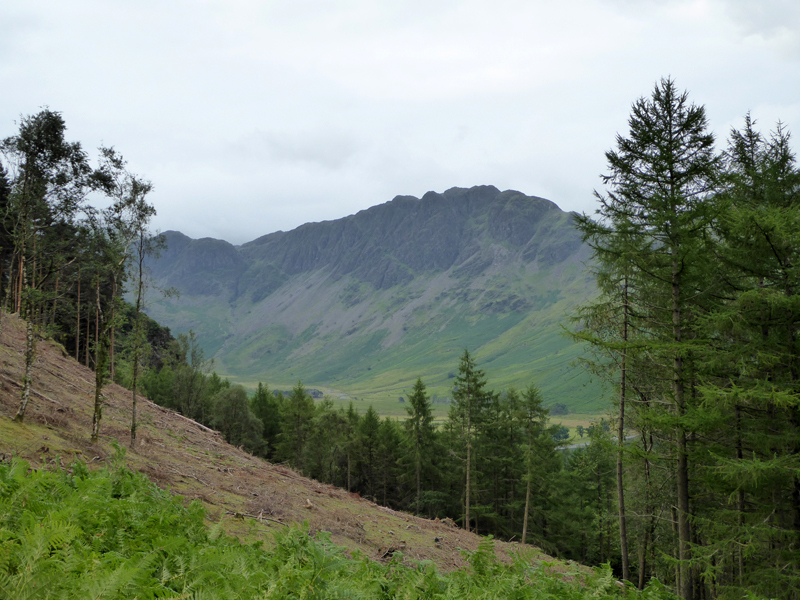 No, we're not in the vicinity of an equine beast, it is the name of the collection of trees on the far side of Buttermere. 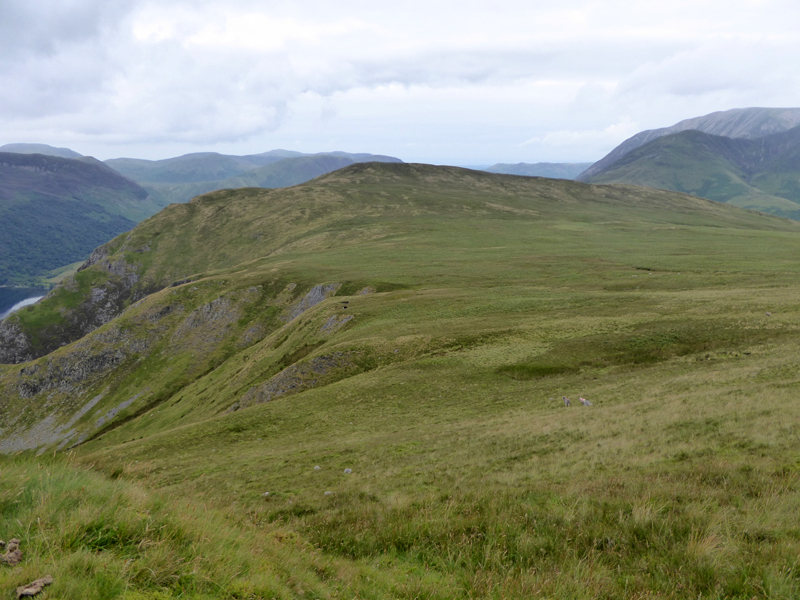 The great chunk of mountain absent from Hassenhow Beck is now fanned out below and has led to a wide fertile acreage of land. 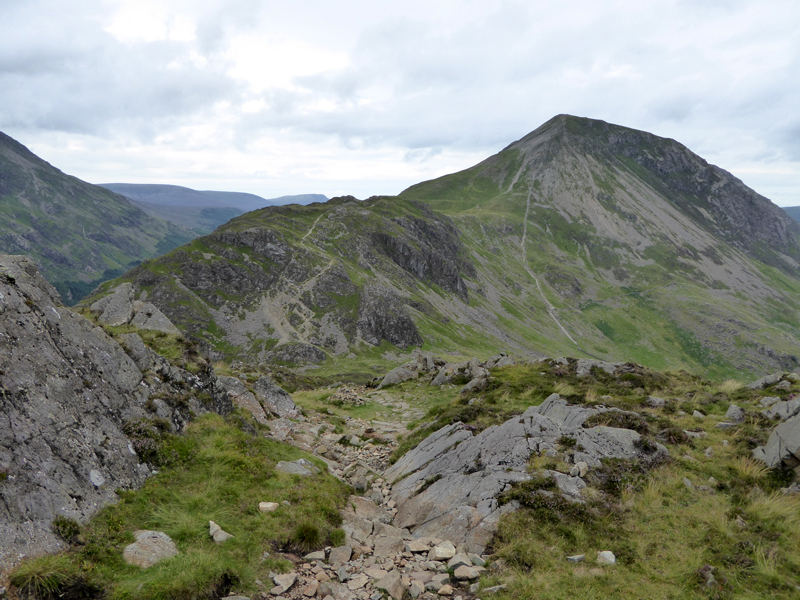 High Crag (left) and High Stile (right) with Burtness Comb hollowed out between the fell tops. 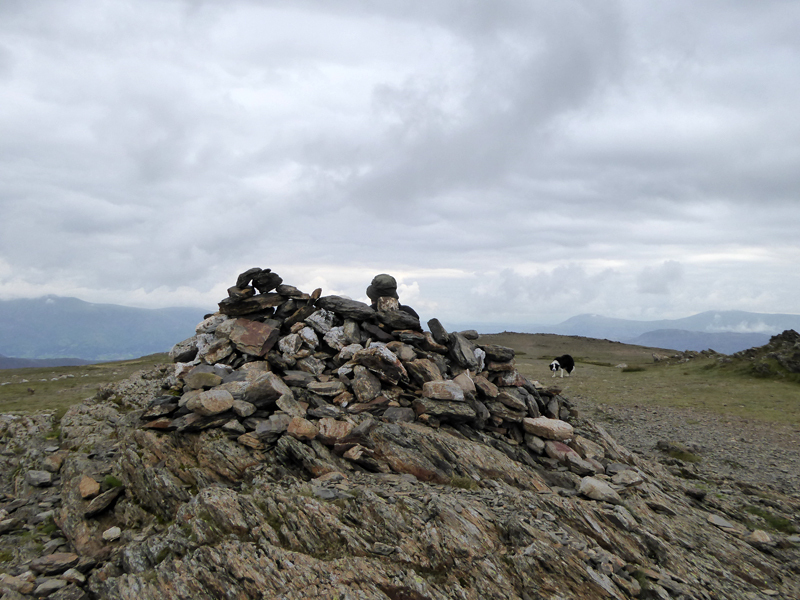 One of the things that most appeals to me about the early start from home and the steep climb of a lesser-heralded fell like Robinson, is that you just know that you will have the summit territory to yourself - and that's a real bonus whichever of the fells your upon. 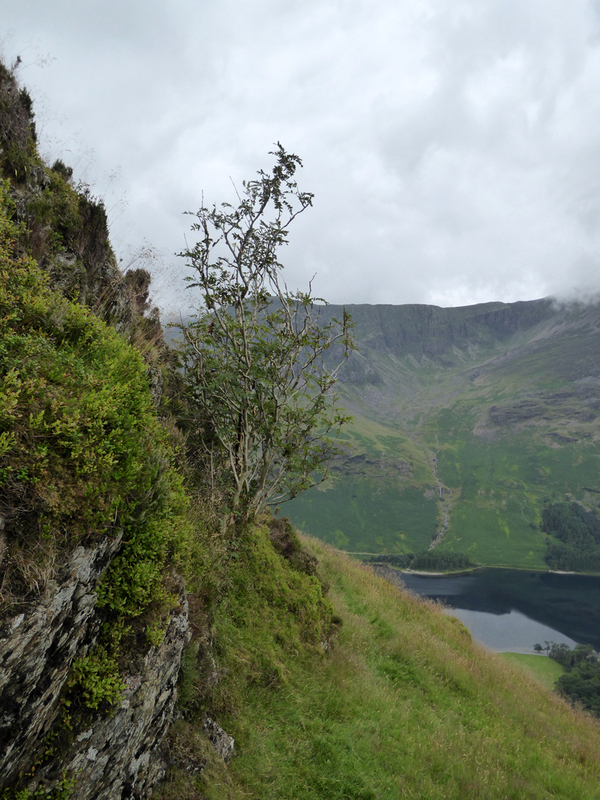 There is a steep climb of about 900ft, probably marginally more fun as a climb than a descent. 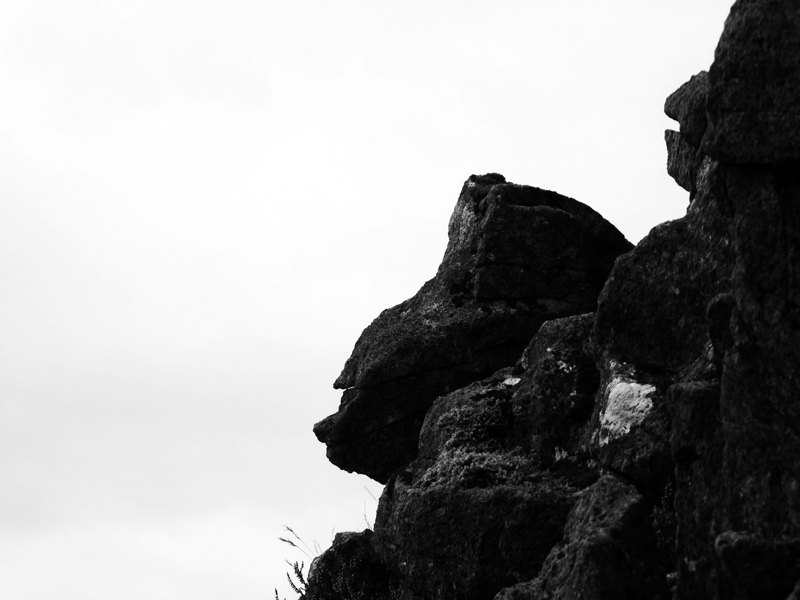 Gravity can be an ally even when climbing uphill - you tend not to fall as far when you slip! 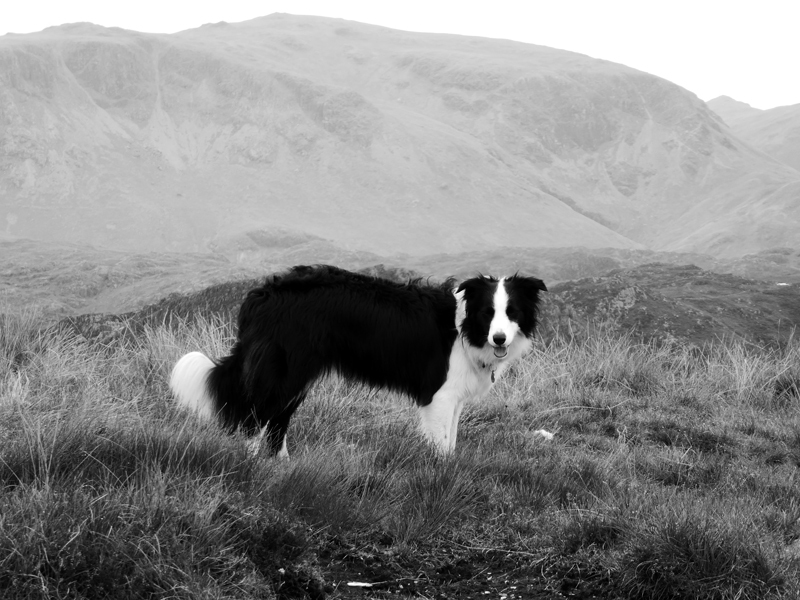 Wainwright refers to Robinson as having a prosaic name, perhaps it takes the name of a local shepherd in the days of fellnaming? 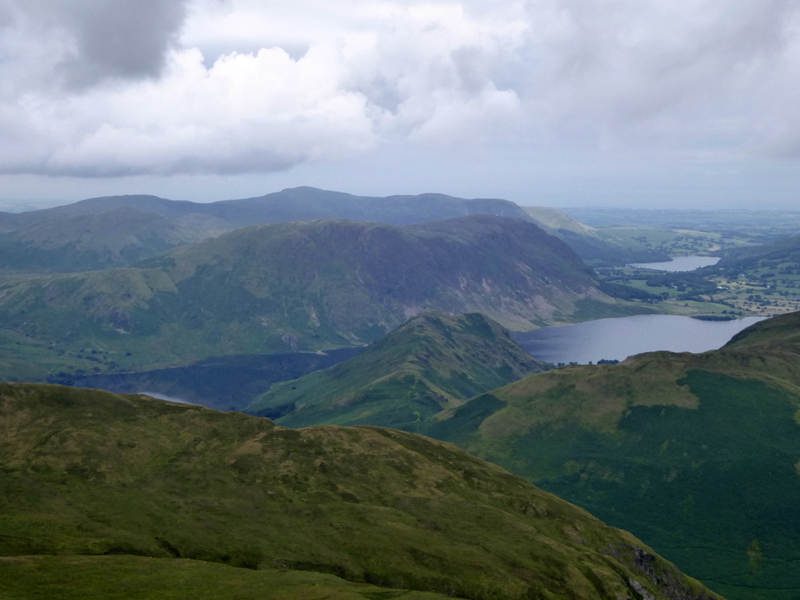 There is much to commend this ascent route, not least the views back to Buttermere and beyond. Sadly, there is nobody left to write to, but this could well be the "young rowan" of the early 1960's referred to in Wainwright's Book 6 Robinson p8. 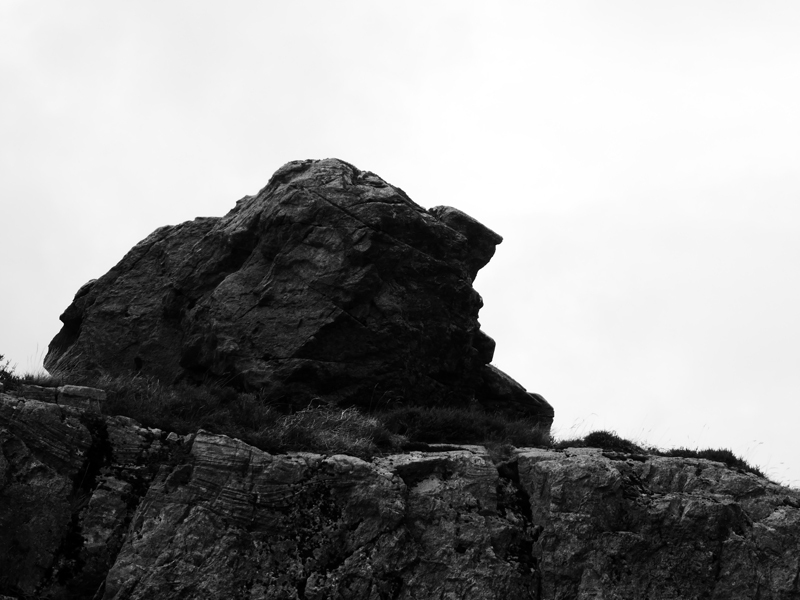 The tree has adapted to its percarious position by growing more than one "trunk" and it is very well attached to the rock. "Molly, stay. Shush, stay, stay" I'd spotted a rare bird on one of the fenceposts and hoped Molly would keep still. Steadily, I switched the camera on and zoomed in - a hint of yellow on its neck made me wonder which breed I'd found way up here. 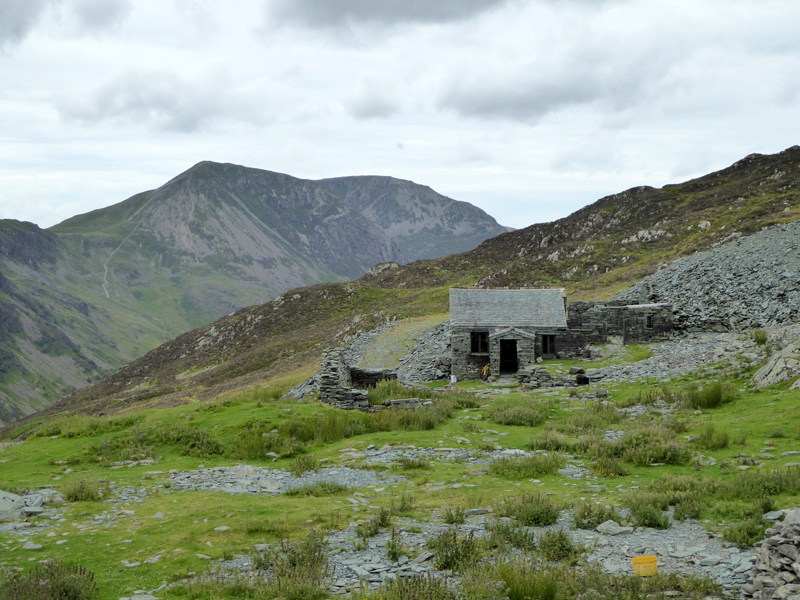 Imagine my chagrin - two walkers are settled in the summit shelter at 09:20hrs. Now, I don't mind folk getting there before me, or spending a minute or two enjoying their achievement, but these two were still there more than ten minutes later!! 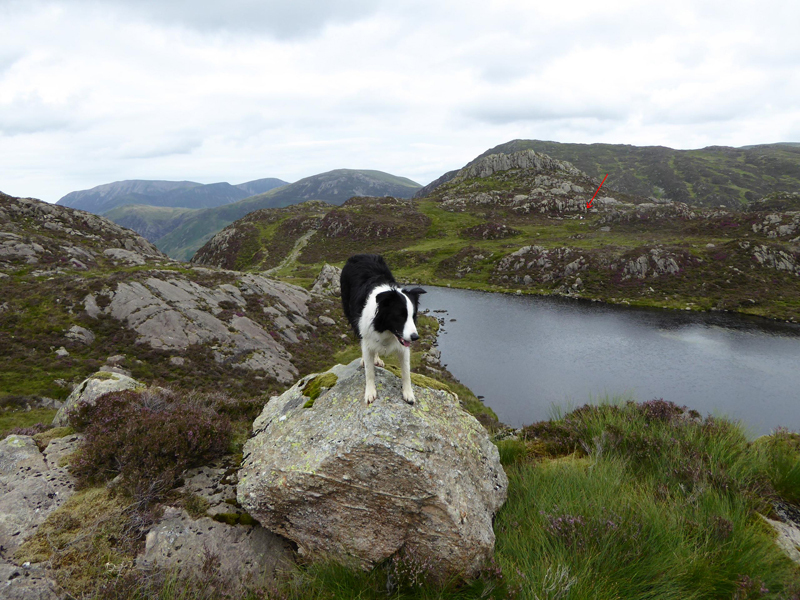 Molly and I went off to the "other" cairn - with a better view - to enjoy some chicken pieces. A full 28 minutes after we first arrived on the top. 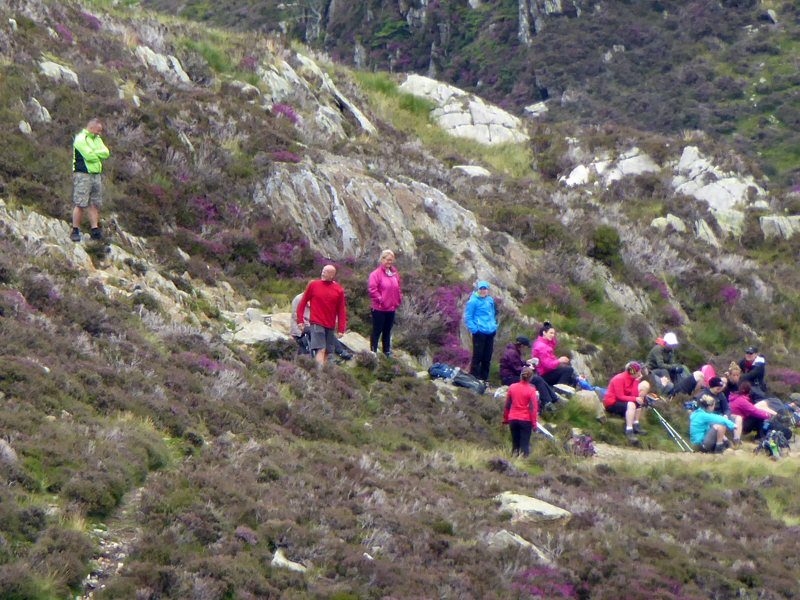 There should be fellwalkers Code of Conduct and Summit-Hogging would be in the list, as would be "Groups". 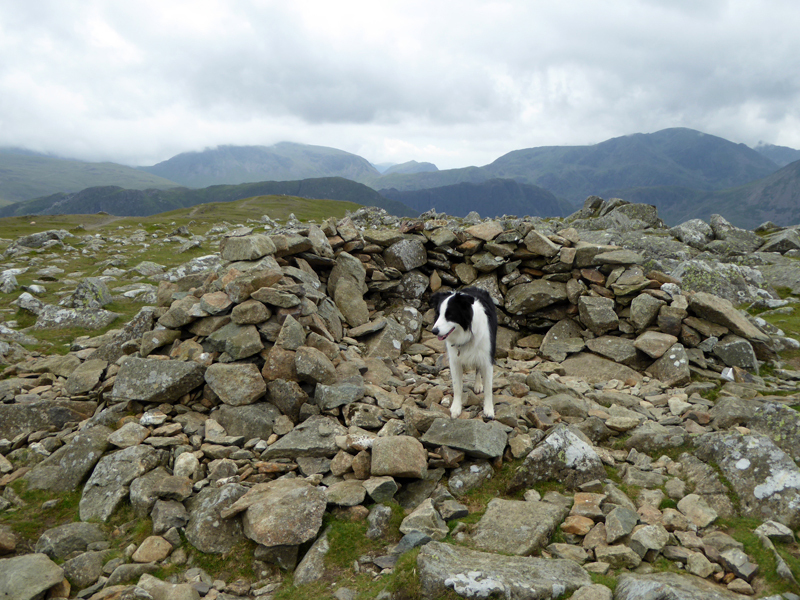 There is not much to say about the walk around to Hindscarth summit. "Hackney Holes" are interesting. 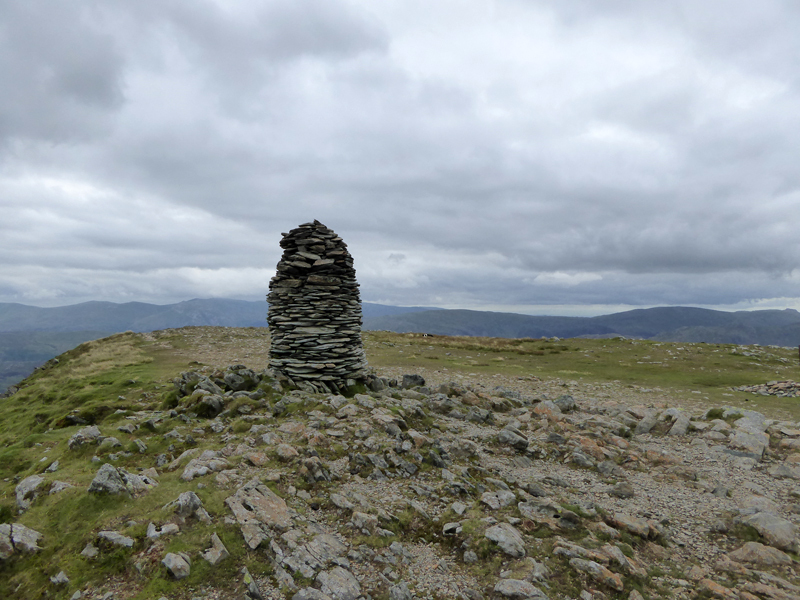 From the cairn at the north end of Hindscarth and then the relatively flat walk around to Dale Head. 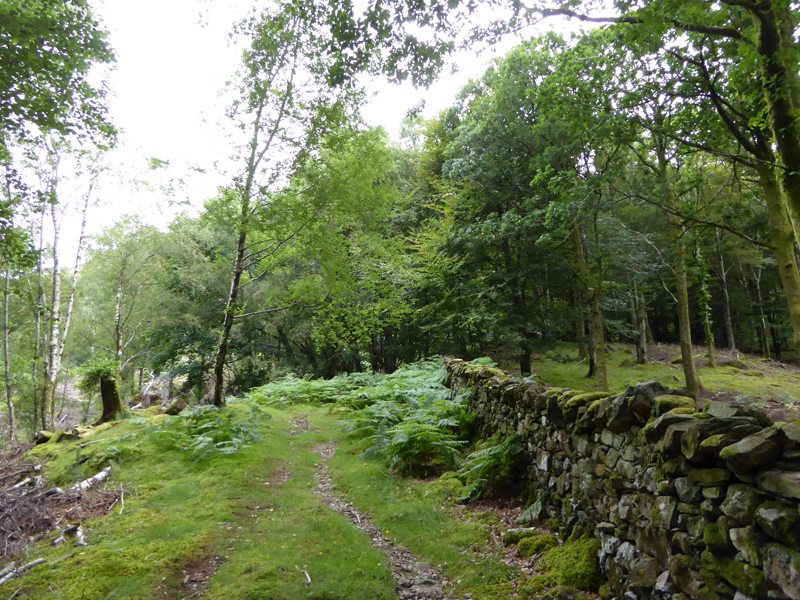 This is pleasant walking and some brightness would have livened things up. 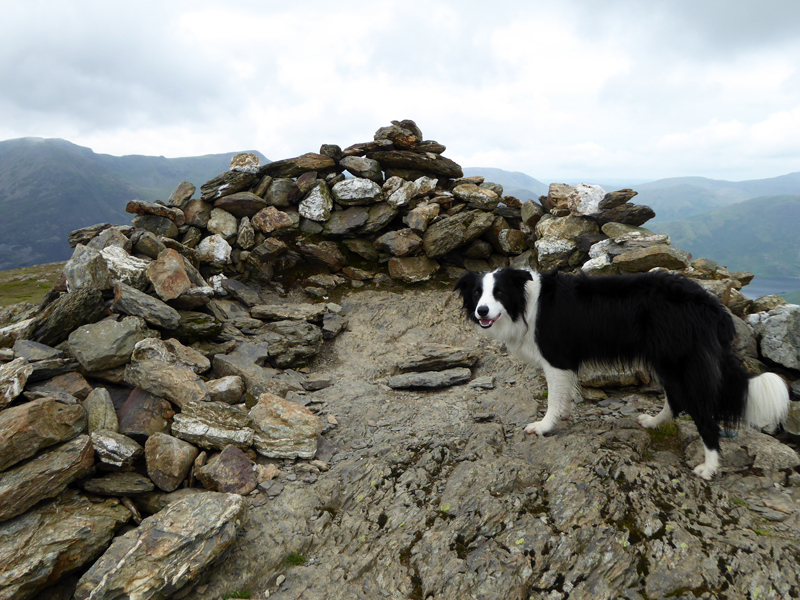 We had Hindscarth summit to oursleves. 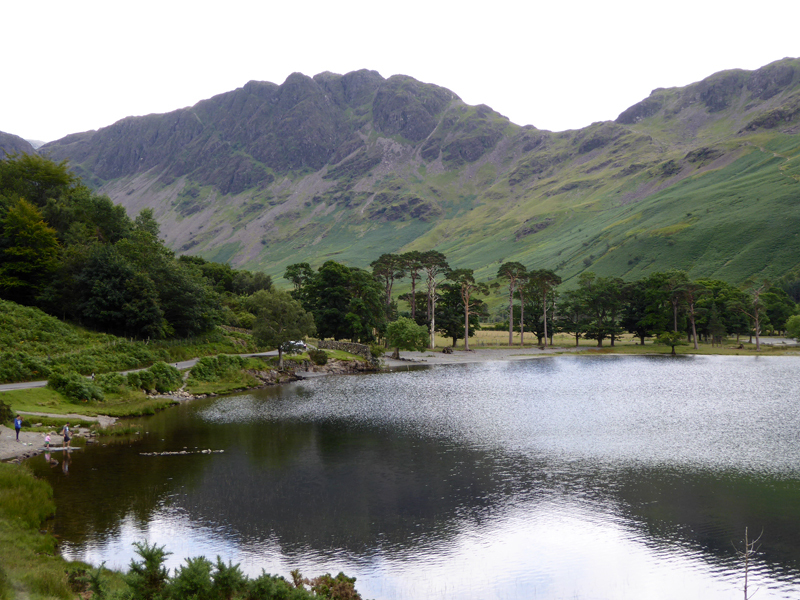 If Dale Head stood more proudly with greater falls on each side, like the one on the north side (above), it would be a more attractive proposition to adventurers. 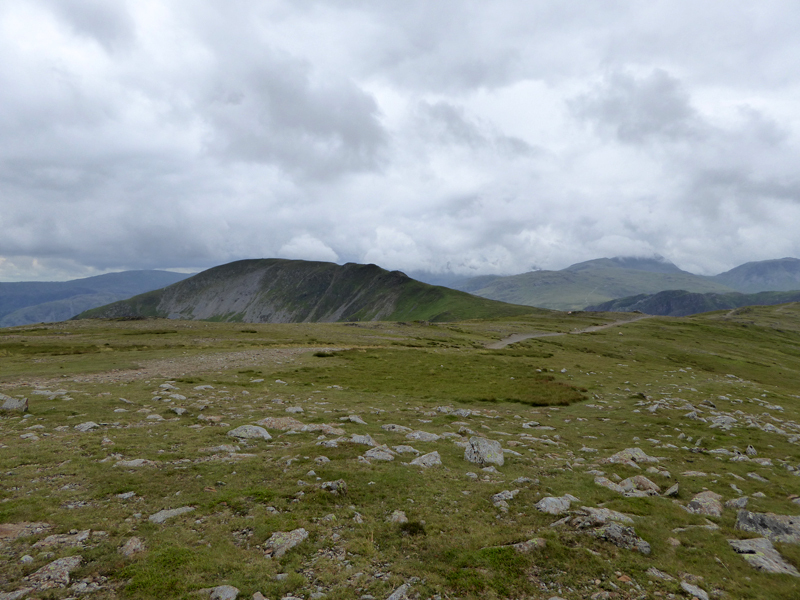 However, the contours to the south and and west are well spaced and the summit is too easily reached from Honister or this way, from Hindscarth. 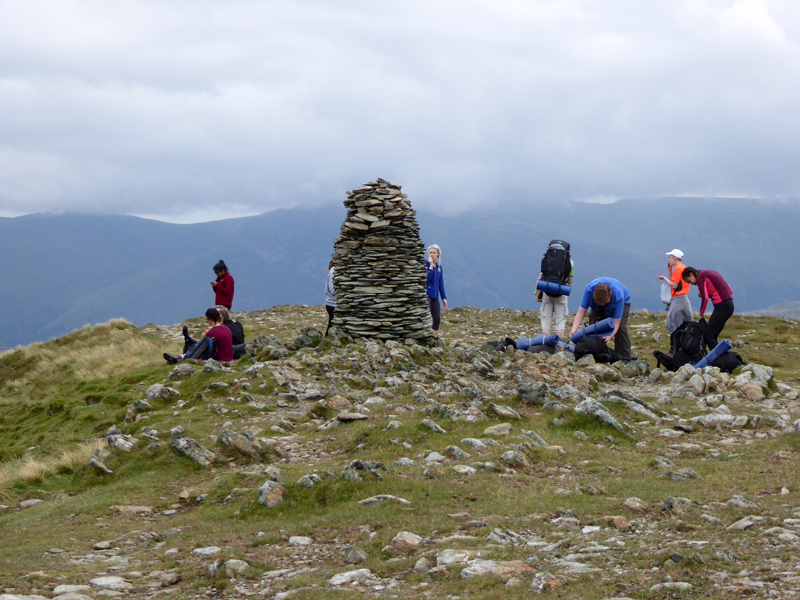 A large group at a summit! I'm not having the best of days, so far. Time for another sit down and more chicken pieces. 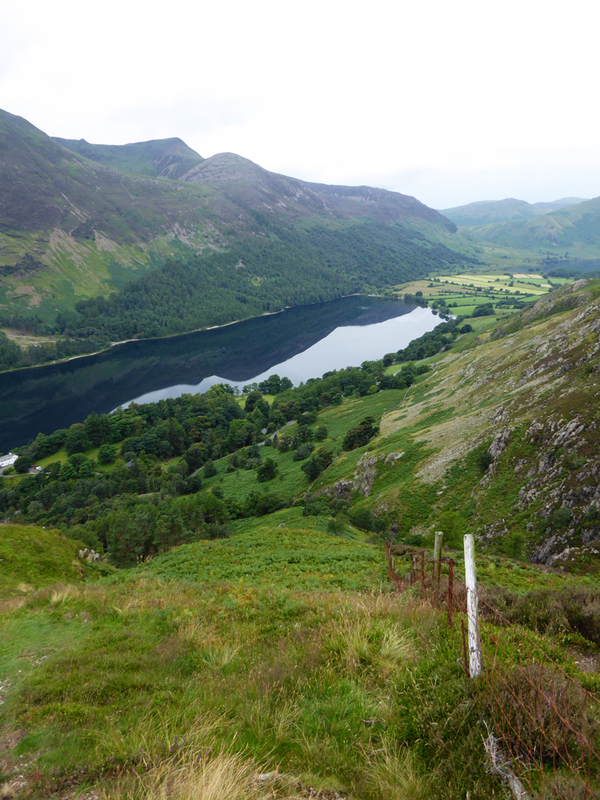 This is part of the view from Dale Head. 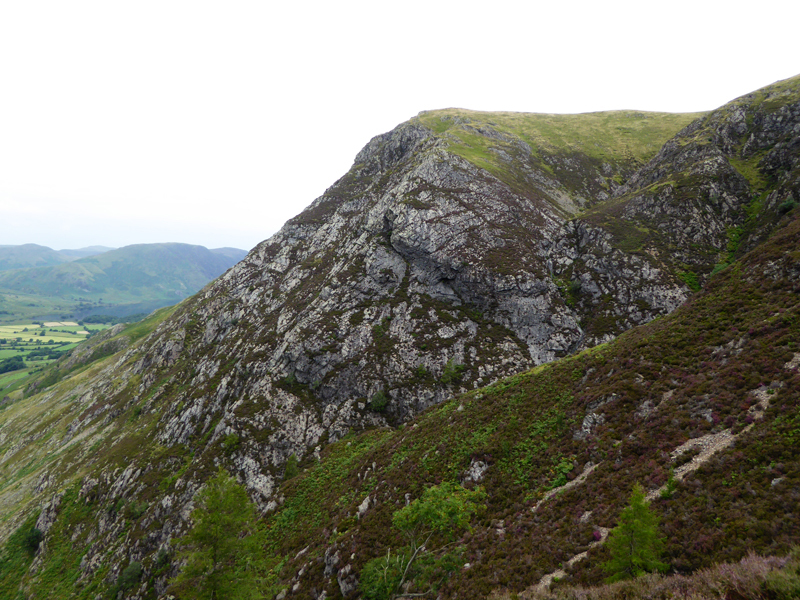 In clearer conditions and with blue skies above, this is a magnificent viewpoint. 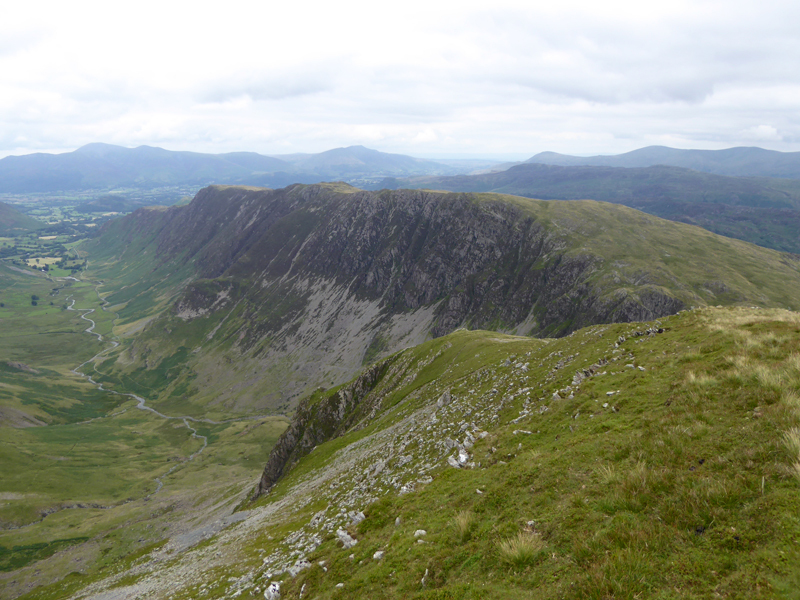 High Spy is the first fell top on the ridge over there. 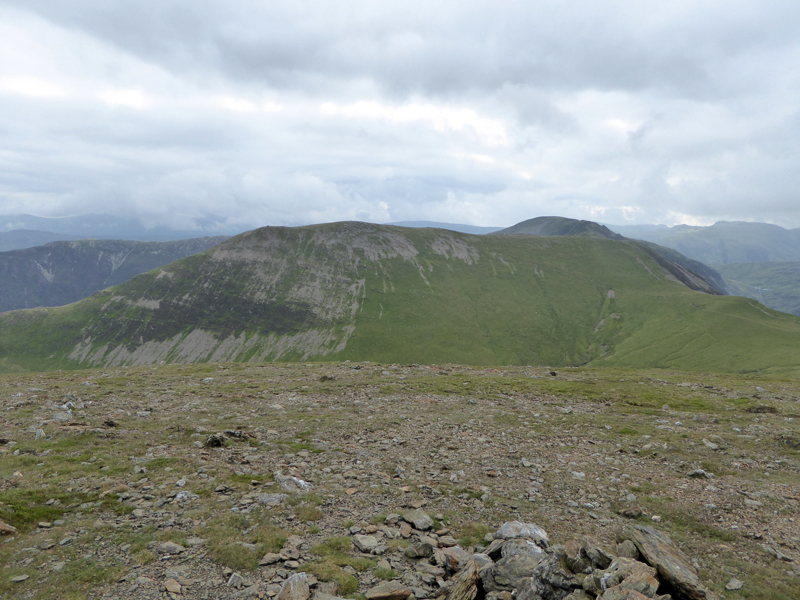 I had a good, long look at the map and decided to defer a decision on the next fell to aim for until after we had arrived at Honister Pass; this decision actually eliminated quite a few tops from the list, including High Spy. 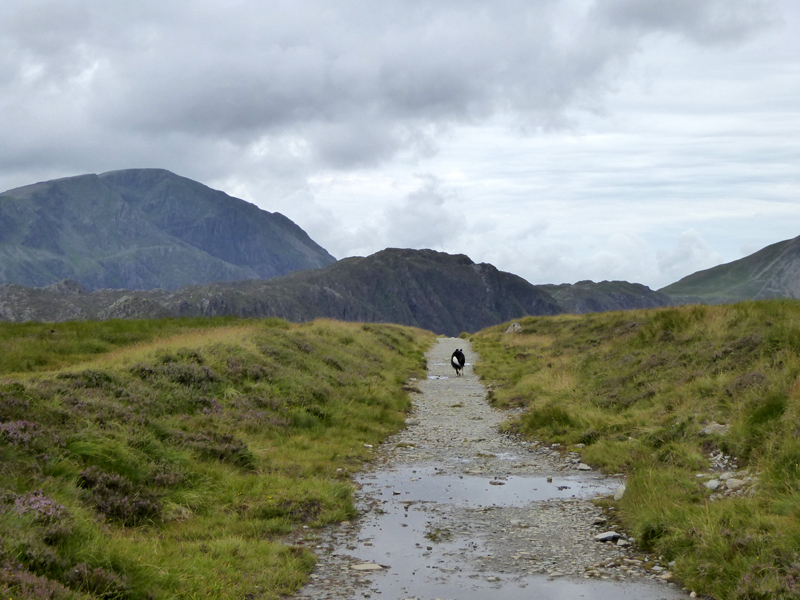 We descended the 1,300ft, to Honsiter Pass. 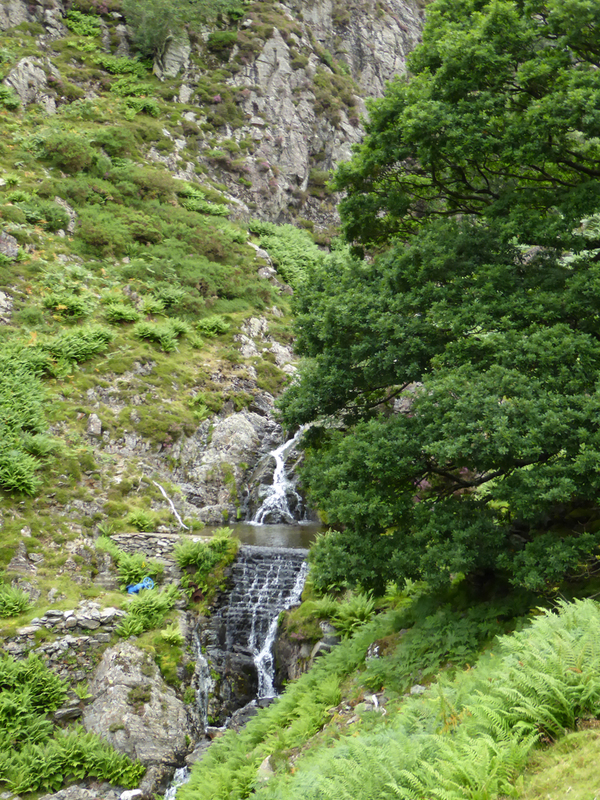 Here, I had left a 2ltr bottle of water in a stream on our way to Hassness. So fresh supplies are ready for us, all being well. 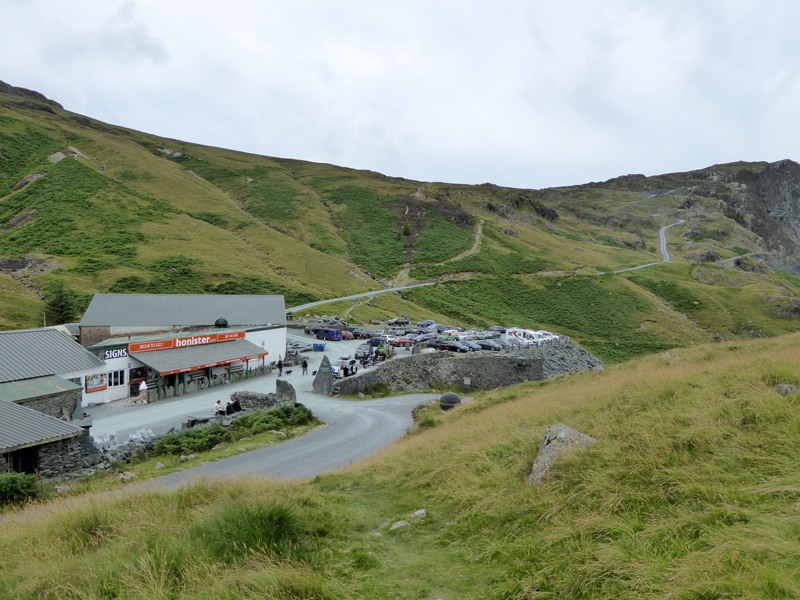 Here at the tourist destination of Honister Mines, I had a brew and decided that Haystacks would be next. 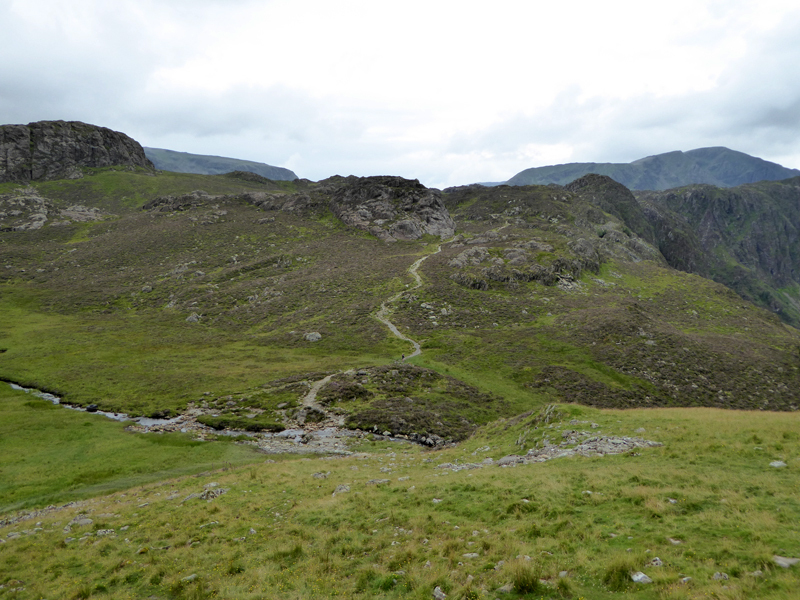 My legs don't really like dropping that kind of height and then climbing again - 1,100ft up to Haystacks summit - more in the event, because of the ups and downs of Haystacks interesting lumps and bumps. The water bottle was still there and duly collected. 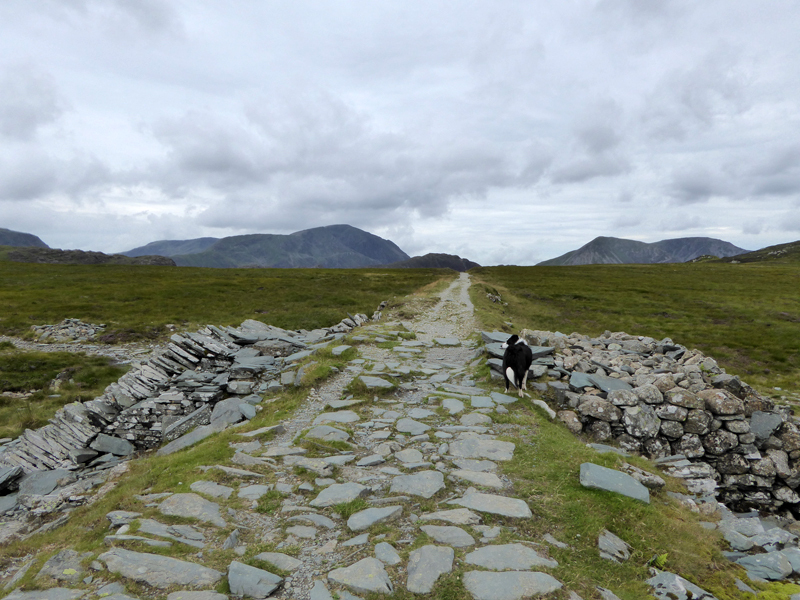 The old tramway up to the dismantled Drum House leads directly to a further track to Dubs Quarry. 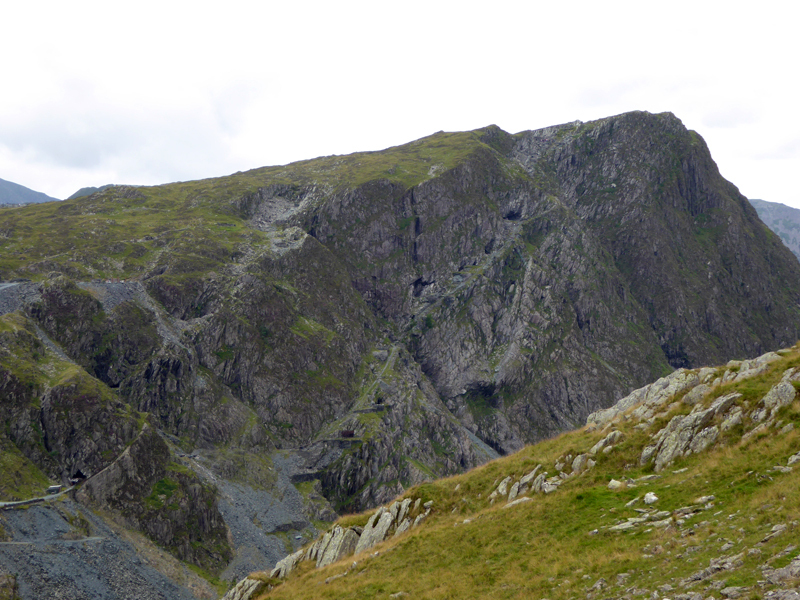 Haystacks is directly ahead in the photo on the right. 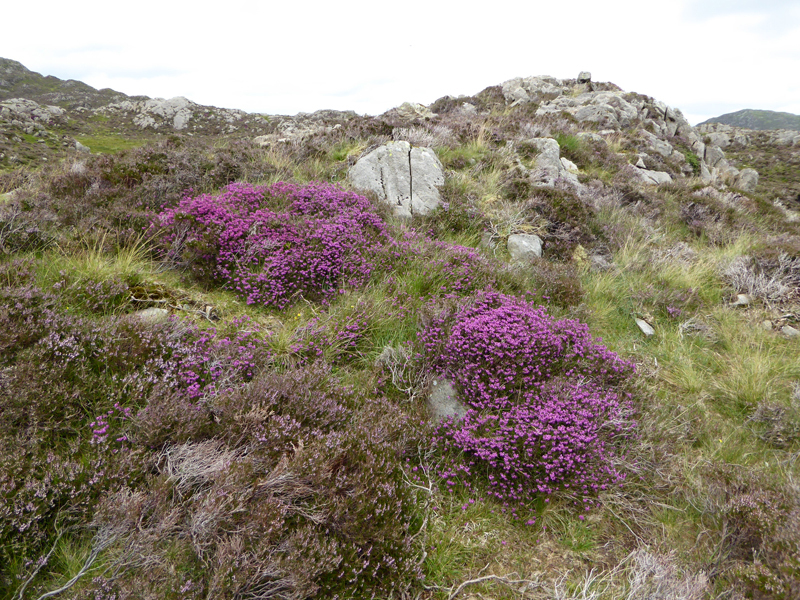 The bothy is available for overnight stays. 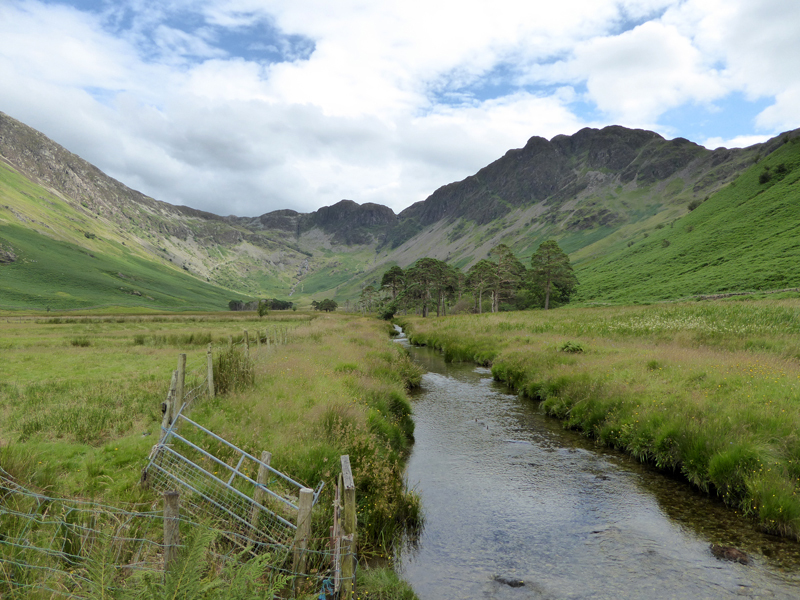 At Dubs Bottom is a stream feeding Buttermere, crossing such and you are on Haystacks at the start of a great walk over Wainwright's favourite fell. The arrow points to a spot close to where the previous photograph was taken. There, a young lady is injured after tripping and cannot continue. In due course, Cockermouth Mountain Rescue Team attended and later, an Air Ambulance arrived and she was taken to Carlisle for further treatment. I have an idea we walked past the lady and one or two others, but didn't notice any problems, but then what could I have done? I do carry a whistle and some plasters. 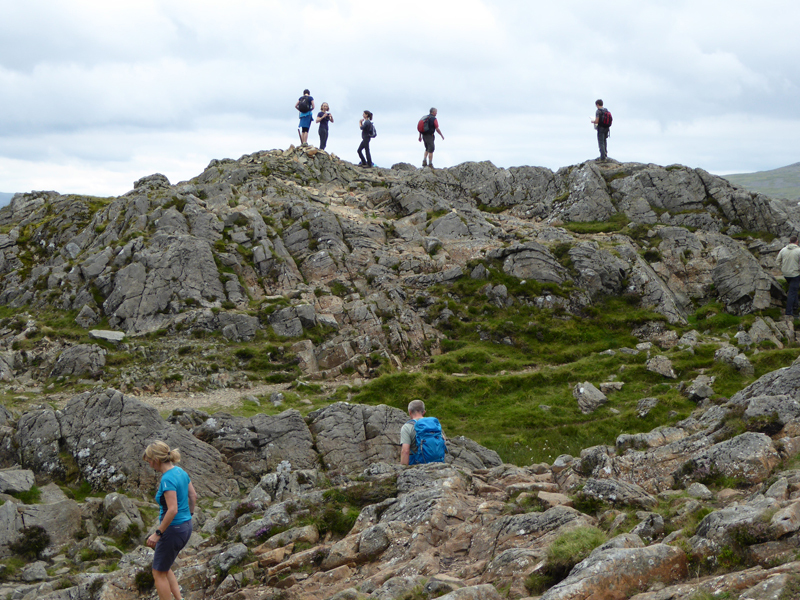 I tend to think that walking in such numbers contradicts the basic purpose of fellwalking. 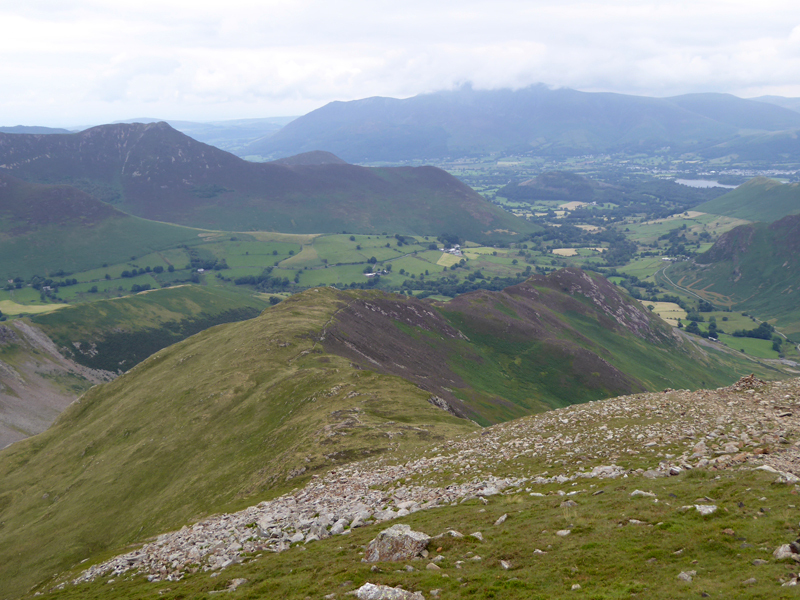 The next fell boasts a gruelling 500ft climb up "Gamlin End". 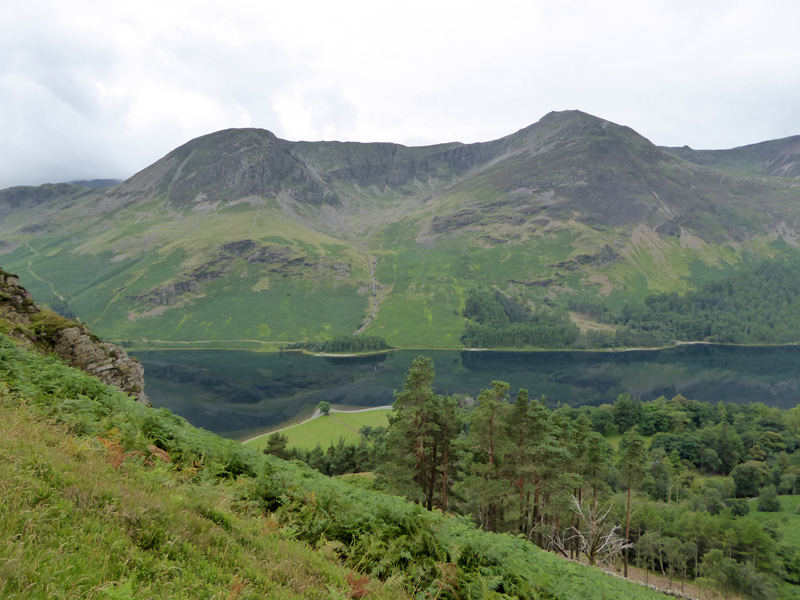 At this point, I call today's fell climbing at an end; targets and lists are great motivators, but hobbies have to basically pleasurable and a line had to be drawn. 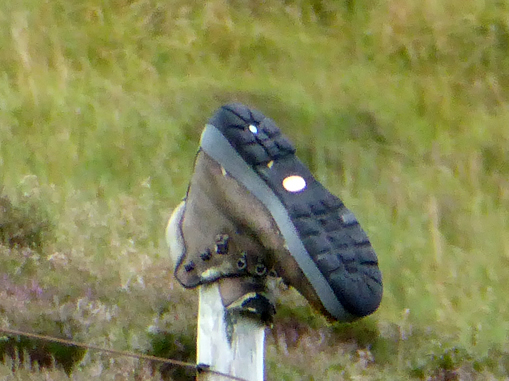 I need to able to walk tomorrow! 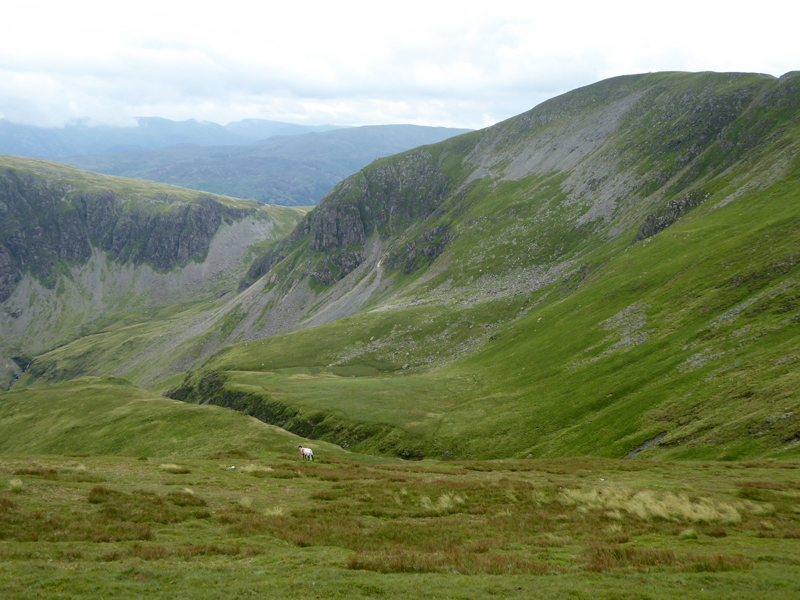 Robinson, as climbed earlier is over there, with High Snockrigg to the left (as you look). 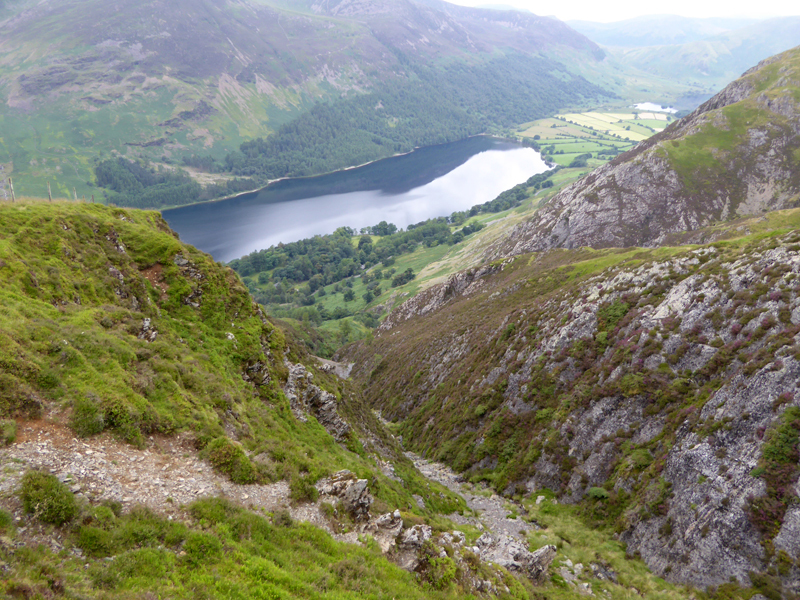 It's a straightforward descent to Buttermere from here. The sun is coming out, how's that for timing? I wonder if the water leaving Dubs Bottom two hous and fifteen minutes ago, has reached here yet? I should have stopped the car here at 07:15hrs this morning and taken a photograph from the same point before the ripples arrived, but I didn't and that's that. A short walk along the road takes us back to the car. 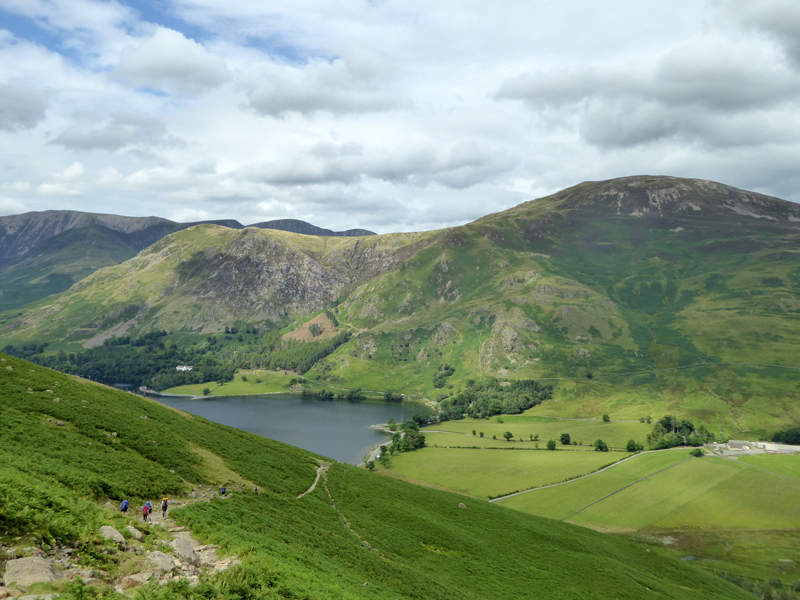 Route: Hassness, Hassnesshow Beck, Robinson, Hindscarth, Dale Head, Honister Pass, Old Tramway, Dubs Quarry, Dubs Bottom, Blackbeck Tarn, Perched Boulder, Haystacks Summit, Scarth Gap, Buttermere, Gatesgarth, Hassness. Greetings: Oh those Hoggers! 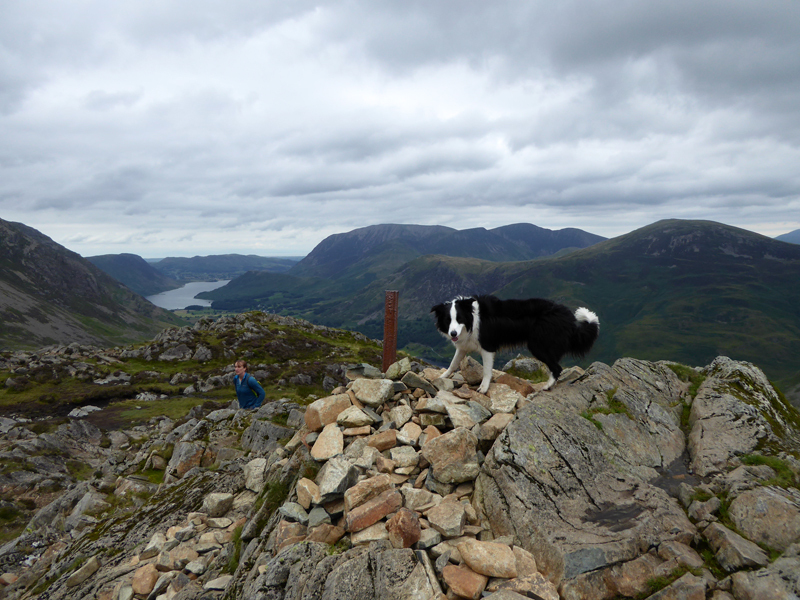 Plenty from Dale Head onwards and anyone seeking solitude needs to give Haystacks a miss. 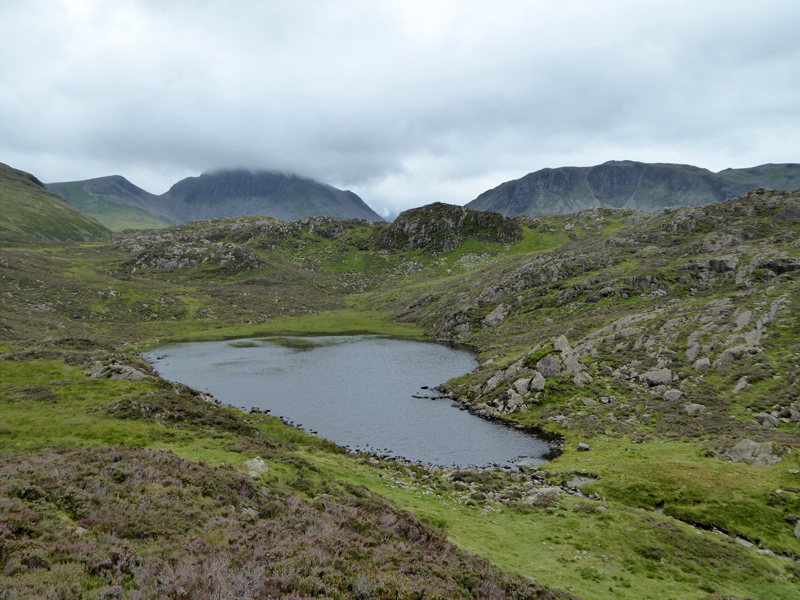 Weather: Dull, dry, no wind; improving to bright and a little sunshine 8 hours after the walk started. 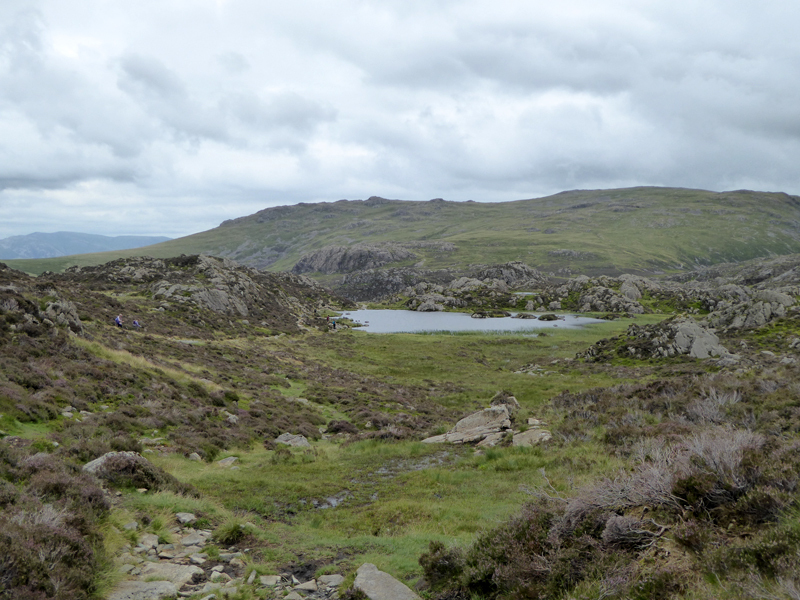 Time Taken: 9 hours over a distance of about 11 miles and approaching 4,000ft of ascent. 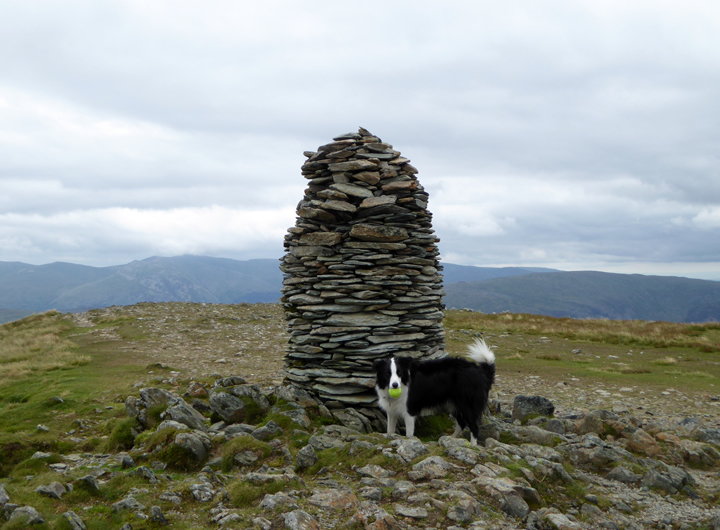 It should be noted that this was an easy-going stroll around the fells and not a route-march, I reckon I could knock a couple of hours off the time if I had somewhere to be after the walk and wasn't so concerned about taking Molly's photo at otherwise unattended summits.